Play By Play is a reading series in New York and San Diego focused on incubating early drafts of new works towards full productions. 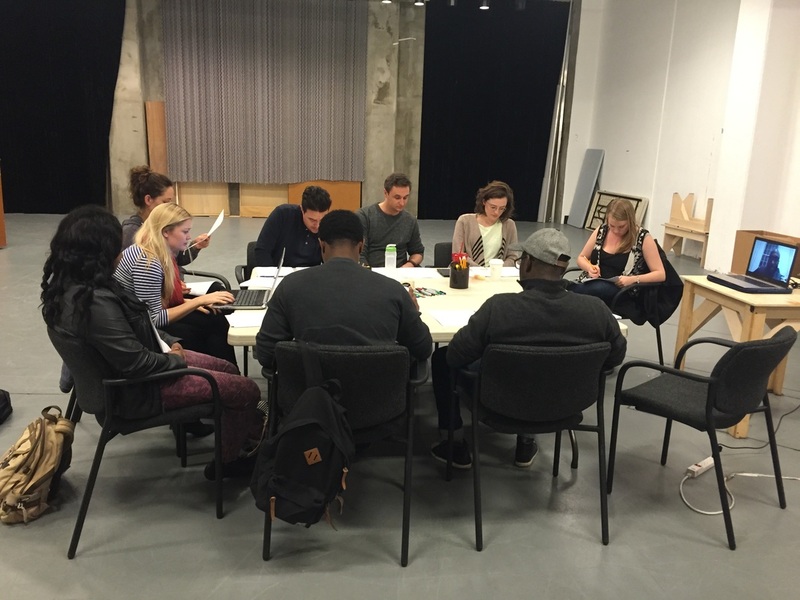 We pair top playwrights with professional actors to hear new works aloud and cultivate scripts in development. First and foremost, our readings aim to serve the playwright, getting language off the page early in the writing process and inviting artistic dialogue. The Play By Play environment strives to be a safe, collaborative space, where playwrights, actors, directors, and literary managers can create, connect, and play. Play by Play utilizes the Liz Lerman Critical Response Technique in all feedback sessions. Click here to download a summary of the process. TYLER KENT founded Play By Play in 2013 at The Old Globe. He’s studied and created theatre in more than forty countries, including residencies with the Shanghai Kunqu Opera Troupe (Shanghai, China) and Maggio Musicale Fiorentino (Florence, Italy). He is an associate company member of PlayGround, Northern California’s leading playwright incubator. Mr. Kent holds a B.A. in Theatre from Whitman College and an MFA in Classical Acting from The Old Globe / University of San Diego. He lives in New York City. LORENZO LANDINI is an actor, writer, and singer. Formerly based in New York City, he is attending the University of San Diego / Old Globe MFA program in acting until the fall of 2017. His last New York City performance exploits were When I Have Cancer in 30 Years – an original one act written and performed by Landini, directed by Alex Hare, The Miser (Brave New World Rep) and GUNS: An Oratorio (Vocals and Rhythm Guitar, Liz Swados. Lorenzo is an Italian-born and fluent English and Italian speaker who moved to the US when very young. He graduated from Columbia University with a B.A. in Drama and Theatre Arts in 2013, and has also trained at the Powerhouse Theatre Festival and the British American Drama Academy. He likes cats, cocktails, and European football, as well as moving and curious works of stagecraft. JENNIFER LANE is a California-based playwright, novelist and teaching artist originally from Troy, Michigan. Her work includes September & Her Sisters (Scripps Ranch Theatre's Out On A Limb Festival, 2015 and 2016); The Seer & The Witch (developed in the Groundbreakers Playwriting Group at terraNOVA, part of the nuVoices for a nuGeneration Festival, a Semi-Finalist of the O’Neill Playwriting Conference, nominated for the Susan Smith Blackburn Prize); and Harlowe (developed under the mentorship of Sarah Ruhl, winner of the Alec Baldwin Fellowship at Singers Forum, workshopped at the Gulfshore Playhouse, presented at the Florida Atlantic University New Play Festival, Finalist for the 2015 Humanitas/CTG Playwriting Prize). Jenny is a teaching artist with the Playwrights Project, San Diego Writers, Ink, and UCSD Extension. She is the Playwright in Residence at the Scripps Ranch Theatre, and a founding member of their New Works Studio. Her dramatic writing is represented by Amy Wagner of Abrams Artists Agency in New York City. MFA: Columbia University. BA: Sarah Lawrence College. For more information, please visit jennifer-lane.net.